The Jordan Movie Blog: What are Best Friends For? So while I think I have the Swine Flu, Lori assures me that it's just a fever. I don't think I'm going into work tomorrow as a result of my fever and overall aching body. If this keeps up perhaps I'll go to the doctor tomorrow afternoon to make sure I'm not battling H1N1. Wikipedia lists the following symptoms of Swine Flu: fever, cough, sore throat, body aches, headache, chills and fatigue. I actually have all of those. We'll see. Josh was extra nice to me tonight and seemed really sad that I'm sick. 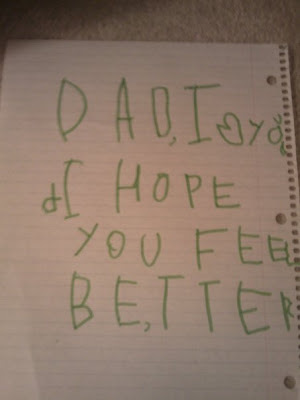 He took time to write the note you see below (asking mom for spelling assistance). Note that he threw in a comma within the last word as I was just teaching him about commas today (apparently two years too early). He sure has a lot of caring in him for a 5-year-old. I know he's hoping I can get better so we can enjoy the upcoming Guys Weekend. More on that later this weekend as Becca and Lori head north to visit Kristin in Massachusetts.